Azul has announced a new nonstop service to Porto, Portugal starting on June 3, 2019. The new destination will receive three weekly flights from Sao Paulo (Campinas), Azul’s main hub, which will have a total of 17 weekly frequencies to Portugal. The Portuguese city is the second destination in Europe to receive flights from Azul after Lisbon. The nonstop flight will be operated on an Airbus A330, with 272 seats. With the addition of this new flight, Campinas, the largest hub in Latin America, will offer nonstop service to 57 destinations, including Orlando, Fort Lauderdale/Hollywood and Lisbon. In partnership with Aigle Azur, Azul also offers flights to Paris, France. 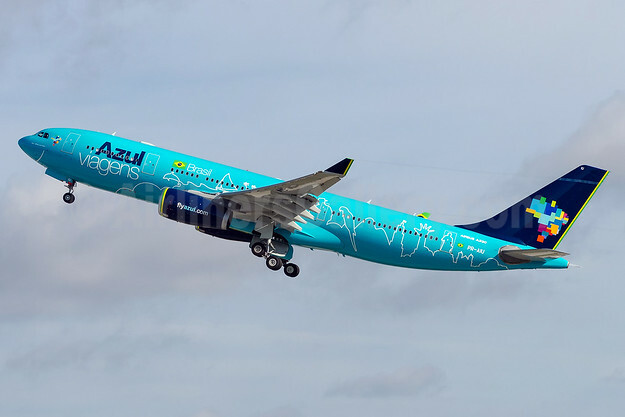 Top Copyright Photo (all others by the airline): Azul Brasil (Azul Linhas Aereas Brasileiras) Airbus A330-243 PR-AIU (msn 494) (Azul Viagens) FLL (Brian McDonough). Image: 931964. 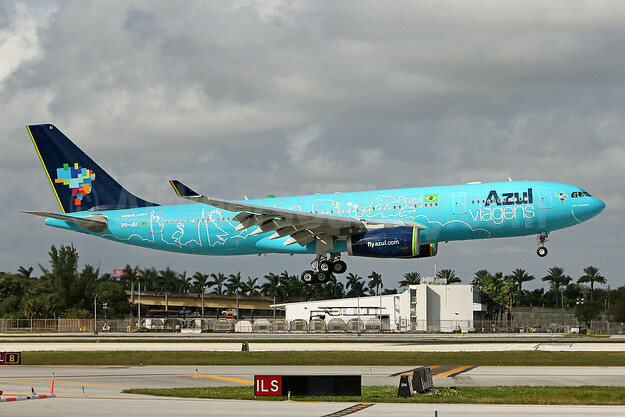 This entry was posted in Azul and tagged Airbus A330-243, Azul, Azul Brasil (Azul Linhas Aereas Brasileiras), Azul Brazilian Airlines, Azul Linhas Aereas Brasileiras, Azul Viagens, msn 494, PR-AIU on December 6, 2018 by Bruce Drum. Countering the headwinds of the current Brazilian economic crisis, Azul Brazilian Airlines announces today an important milestone that positions it as an even stronger and more competitive airline. The Chinese international conglomerate HNA Group has selected Azul as its primary strategic investment in Latin America. In one of the largest equity investments in a Brazilian company this year, Azul received a firm commitment from HNA Group, subject to completion of certain conditions precedent, for the investment of $450 million (US) in exchange for an economic stake of 23.7%. As a result, HNA Group will be Azul’s newest shareholder and board member. With this equity raise, Azul will have one of the strongest balance sheets in Latin America. Over the past 20 years, HNA Group has successfully transformed itself from a traditional aviation company to a global conglomerate spanning the aviation, real estate, finance, tourism, and logistics sectors, with revenues of $21 billion and over 110 thousand employees. HNA Group has a solid experience with aircraft lessors and has recently invested in Swissport, a renowned global aviation handling company. Within its aviation group, HNA owns 14 airlines with a total fleet of 561 aircraft. “HNA Group is committed to expanding in the airline industry through strategic investments in companies with strong market positions and excellent management teams. We are pleased to partner with Azul in order to bring more choice and convenience to our customers traveling to and from Brazil. We eagerly look forward to working with Azul founder David Neeleman and his team for the mutual benefit of both airlines,” said Adam Tan, President of HNA Group. This investment will bring significant benefits to Azul including a stronger cash position, support for its fleet plan, product and service improvements. Moreover, the partnership between Azul and HNA Group will result in commercial agreements, joint negotiation efforts, and adjustments in aircraft allocation. Finally, it also enables the company’s entry into the Asian market. Seabury Securities LLC, Seabury Group’s investment banking unit, served as financial advisor to Azul. Copyright Photo: Rodrigo Cozzato/AirlinersGallery.com. Azul is smiling. Azul Brazilian Airlines (Azul Linhas Aereas Brasileiras) Embraer ERJ 190-200 IGW (ERJ 195) PR-AUB (msn 19000660) arrives at Sao Paulo (Guarulhos). This entry was posted in Azul, HNA Group and tagged 19000660, Azul, Azul Brazilian Airlines, Azul Linhas Aereas Brasileiras, E195, Embraer, Embraer 195, Embraer ERJ 190-200, Embraer ERJ 195, ERJ 195, HNA Group, PR-AUB on November 24, 2015 by Bruce Drum. Why is David Neeleman buying a controlling share of problem-plagued TAP Portugal? David Neeleman, the airline entrepreneur who was involved with running Morris Air (Salt Lake City) with June Morris before he founded NewAir (later JetBlue Airways) (New York) and later Azul Brazilian Airlines (Sao Paulo), has struck out again with a new airline venture. This time he is not creating something new but buying into something old. Neeleman lead an investment group which has been selected by the state of Portugal to acquire their controlling share in troubled flag carrier TAP Portugal (Lisbon) for €348 million ($391 million), outbidding investor German Efromovich. Besides running Azul, he will now be running trouble-plagued TAP Portugal. His group will control 61 percent of the stock of TAP Portugal. Neeleman’s group will upgrade the carrier with new aircraft (probably new Embraers for the European routes). TAP Portugal is also likely to receive a new makeover with the new ownership group, possibly with a new blue theme. Portugal is the mother country of Brazil. The ties are strong. Both countries speak the same language and the traffic patterns are strong between Brazil and Portugal. The Azul-TAP alliance will now compete against TAM and the LATAM Airlines Group which wants to increase the number of flights between Brazil and Europe. The battle lines are being drawn in Brazil. For Neeleman, his Brazilian roots are deep. According to Wikipedia, Neeleman was born in São Paulo, Brazil, but raised in Miami. He lived in Brazil until he was five. He later attended Brighton High School in Cottonwood Heights, Utah, and attended the University of Utah for three years before dropping out. He served on a religious mission for The Church of Jesus Christ of Latter-day Saints (The Mormons) in the Northeast Region of Brazil. After starting JetBlue Airways, CEO David Neeleman on May 10, 2007 was forced out and replaced by David Barger. Neeleman headed south, back to his original roots. On March 27, 2008 Neeleman officially announced plans to launch a new airline, Azul (Portuguese for “blue”). 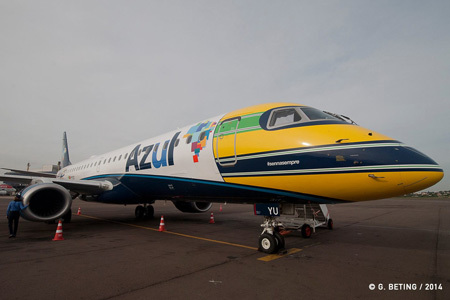 Azul is now Brazil’s third largest airline and it is expanding internationally. Also according to Wikipedia, Neeleman lives with his family in New Canaan, Connecticut, United States. He is the father of nine children. In 2000, he disclosed to CNBC that he has adult attention-deficit disorder (see the video above). When Azul expanded to the United States it picked two cities that are big on the JetBlue Airways route map – Fort Lauderdale/Hollywood and Orlando, Florida. The ties between Azul and Neeleman’s old JetBlue Airways remain strong. JetBlue has considered larger aircraft and longer-range routes to Latin America in the past. In essence, Azul is now filling this void (at least to Brazil) with its newly-acquired Airbus A330s. It is very likely that Neeleman has much bigger plans in mind. The synergy between Brazil (and Latin America), North America and Europe are strong. For Neeleman, he now has the European piece in place once he solves the problems plaguing the flag carrier of Portugal. He also has remaining ties to the North American airline he founded – JetBlue Airways. Are the three the future base of a much larger airline alliance? For JetBlue, their strategy is to make airline friends with any international carrier that has the potential of code sharing at their point of entry into the United States. They have successfully carved out a niche feeding international airlines especially at New York (JFK), Orlando and Fort Lauderdale/Hollywood. This strategy has recently put them at odds with the “Big Three” (American, Delta and United) over the on-going Open Skies dispute with the “Gulf Big Three” (Emirates, Etihad and Qatar). Due to their stance, their ties with the Gulf Big Three are likely to expand. Will Qatar Airways leave the oneworld alliance for JetBlue? There is a lot of potential for a future Azul-TAP Portugal-JetBlue alliance although JetBlue is unlikely to do anything that would upset any relationship it has. For David Neeleman, this is only the beginning. Video: GE Capital. David Neeleman on Leadership and Innovation. This entry was posted in Azul, TAP Portugal and tagged Azul, Azul Brazilian Airlines, Azul Linhas Aéreas Brasileiras S. A., Azul Linhas Aereas, Brazil, David Neeleman, JetBlue, JetBlue Airways, Portugal, TAP Portugal on June 13, 2015 by Bruce Drum. Azul Brazilian Airlines (Azul Linhas Aereas Brasileiras) (Sao Paulo-Viracopas) in partnership with IAS (Instituto Ayrton Senna) pays his tribute to the 20 years of the immortal legacy of Ayrton Senna with a new logo jet. April 29 marked the launch event of the partnership between the Ayrton Senna Institute and Azul in Porto Alegre. Ayrton Senna da Silva (1960 – 1994) was a Brazilian racing driver who won three Formula One world championships according to Wikipedia. He was killed in an accident while leading the 1994 San Marino Grand Prix. He was among the most dominant and successful Formula One drivers of the modern era and is considered one of the greatest drivers in the history of the sport. IAS – Ayrton Senna Institute is a non-profit organization set up in 1994 to promote and enhance education throughout Brazil. Every year, they change the lives of around 2 million poor, undereducated Brazilian children, by offering recurrent training by 75,000 professors all around the country. Azul has started a partnership with IAS after donating to the institute 1 million points on the Azul FFP – Tudo Azul mileage program. Therefore, travelling all around Brazil (Azul currently serves over 100 domestic destinations) will become a reality to IAS and its business partners. The painting of the pictured Embraer 195, registration PR-AYU (msn 19000434) coincides with the 20-year anniversary of Ayrton Senna’s tragic death in Italy. His legacy lives on with partnerships like this. This entry was posted in Azul and tagged 19000434, Aryton Senna, Ayrton Senna, Ayrton Senna Institute, Azul, Azul Brazilian Airlines, Azul Linhas Aéreas Brasileiras S. A., Embraer, Embraer 195, Embraer ERJ 190-100 IGW, IAS, Port Alegre, PR-AYU on April 30, 2014 by Bruce Drum. Azul Linhas Aéreas Brasileiras S. A. (Azul Brazilian Airlines) (Sao Paulo), founded by David Neeleman of JetBlue Airways (New York) and Morris Air (Salt Lake City), is coming back to the United States (in a way). to and from United States gateways. Azul expects to debut its first international flights by early 2015. The U.S. flights will be served from Azul’s brand new $1.5 billion terminal at Sao Paulo (Campinas), strategically located 50 minutes from downtown Sao Paulo. Campinas is Brazil’s largest airline hub offering connections to 104 domestic cities. Azul’s U.S. gateways will be announced later this year. Azul will operate the new international routes with a fleet of 11 wide-body Airbus aircraft. The airline has ordered five Airbus A350-900 with deliveries beginning in early 2017. In addition, six Airbus A330-200 will be used to launch service in early 2015. The new aircraft will be leased from ILFC and will be equipped with Rolls-Royce engines. 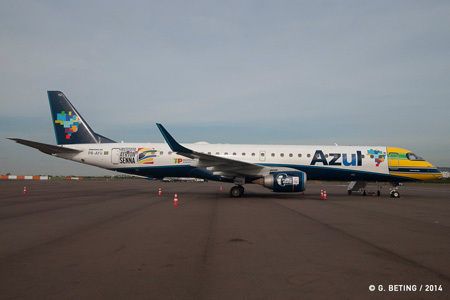 Azul’s fleet currently comprises of 80 Embraer and 56 ATR aircraft. 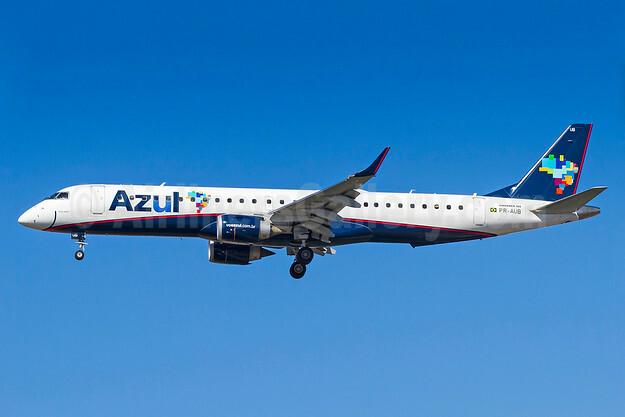 With less than six years of operations, Azul already has flown more than 85 million customers and changed the face of air travel in the Brazilian market since its first flight, on December 15, 2008. The foundation of the airline was built around the Brazilian made Embraer E-jet. 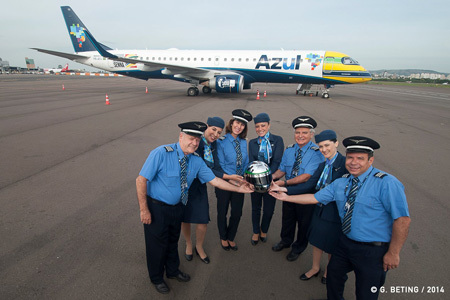 From that foundation, Azul has expanded to 880 daily flights, which represents one-third of Brazil’s daily departures. The airline currently operates a fleet of 136 aircraft and employs more than 10.000 people. This entry was posted in Azul and tagged A330, A330-200, A350, A350-900, Airbus, Airbus A330, Airbus A330-200, Airbus A350, Airbus A350-900, airbus aircraft, Azul, Azul Brazilian Airlines, Azul Linhas Aéreas Brasileiras S. A., Azul Linhas Aereas Brasileiras, Campinas Airport, David Neeleman, JetBlue Airways, Sao Paulo on April 23, 2014 by Bruce Drum.